CURITIBA: David Villa extended his record goalscoring run at the World Cup on Monday and broke down in tears as he left the field as a Spain player for the final time. Despite crashing out of the tournament, the world and European champions ended their World Cup campaign with a 3-0 victory over Australia. 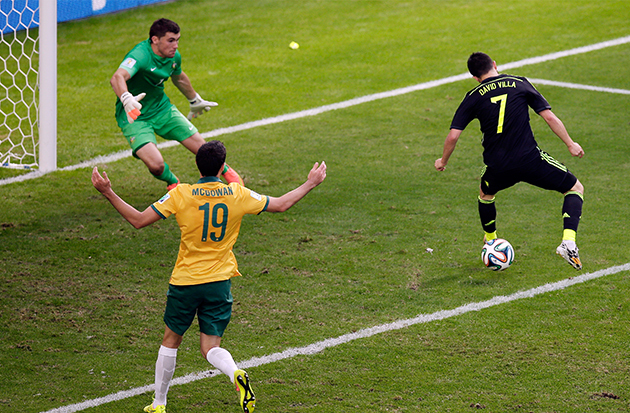 Villa registered his 59th international goal in his 97th and final appearance just before half-time. However, the country's all-time leading goalscorer was surprisingly replaced by Vicente del Bosque just before the hour mark. Despite being consoled by teammates, Villa cut a dejected figure as his stellar international career came to an end. "I have always had a lot of love for the national team and it has always been what I dreamed about," said the 32-year-old. "I would play until I am 55 but that is impossible and I have to be realistic." Villa ended his club career in European football as a champion with Atletico Madrid as they became the first side outside Real Madrid and Barcelona to win La Liga for 10 years. Yet, having taken the decision to move to New York City in Major League Soccer after a brief stint with Melbourne City in the coming months, Villa knows the move also ends his chances of competing at the top level with Spain. "I have taken a decision to go to the MLS and, therefore, I will not be playing for a few months which makes things difficult." Unfortunately for Villa there was to be no glorious goodbye as his goalscoring sign off came after Spain had already been eliminated by defeats to the Netherlands and Chile. However, he praised the professionalism and pride of his teammates to end their disappointing campaign with a win. "To play with the national team has always been a joy. After the first two games when we were well beaten we had to say goodbye giving everything we had and we did. "I am happy to have participated in the first goal. "We are sad to be going home because we aspired to much more, but at least we have given it our all." Villa was the spearhead at the beginning of Spain's record three consecutive major tournament triumphs. Top goalscorer at both the European Championships in 2008 and the World Cup in 2010, he sits 21 goals clear of Fernando Torres as the highest scoring active player for his country. However, he said he would happily see that record broken if it leads to more Spanish success in the future. "I hope that very few years pass before my record is broken because it would be good for Spain. It would be a priviledge for someone to pass my record because I will always be in the history of the national team." Goalkeeper Pepe Reina led the tributes to the legacy that Villa has left behind. "Of course he was annoyed when he came off because he wanted to play until the last minute, but it was the manager's decision. "He leaves great memories and a huge hole on a personal level. He has given this team a huge amount."